Joseph PARKIN-2664 was born about 1704 in of Ecclesfield, Yorkshire, England, United Kingdom. Joseph married (MRIN:1491) Ann FOSTER-2665 on 13 Nov 1729 in Ecclesfield, Yorkshire, England, United Kingdom. In the parish of Ecclesfield, Yorkshire, England, there are several small hamlets. Joseph Parkin, a nailer, and his wife, the former Ann Foster, lived in a couple of them, Loundside in 1730 and Lane End in 1733 and 1736. Children were christened in those years. The couple had been married in 1729 at the Eccles­field parish church. The family next moved into the neighboring chapelry of Wentworth, where six more children were christened during the years 1737 to 1748. The family residence was, at least during Joseph's and Ann's later years, in the hamlet of Thorpfield­side. Joseph died before 1782 (there is a gap in the record of Wentworth burials 1756-1777), as in 1782 Ann is called a widow in the will of their son Samuel. Samuel, who had prospered and was called “Gentleman,” also names his brothers and sisters, appointing his brothers executors. Ann FOSTER-2665 was born about 1708 in of Ecclesfield, Yorkshire, England, United Kingdom. She was buried on 4 Dec 1788 in Wentworth, Yorkshire, England, United Kingdom. Ann married (MRIN:1491) Joseph PARKIN-2664 on 13 Nov 1729 in Ecclesfield, Yorkshire, England, United Kingdom. Samuel PARKIN-5526 was christened on 11 Oct 1730 in Ecclesfield, Yorkshire, England, United Kingdom. Samuel's will was probated in Dec 1782 in Ecclesfield, Yorkshire, England, United Kingdom. Mary PARKIN-5527 was christened on 3 Aug 1733 in Ecclesfield, Yorkshire, England, United Kingdom. M iii Joseph PARKIN-5528 was christened on 1 Jan 1735/1736. Ann PARKIN-5529 was christened on 16 Nov 1737 in Wentworth, Yorkshire, England, United Kingdom. Hannah PARKIN-5530 was christened on 1 Jan 1739/1740 in Wentworth, Yorkshire, England, United Kingdom. M vi Jonathan PARKIN-2653 was christened on 7 Mar 1741/1742. He was buried on 30 Jul 1814. Christian PARKIN-5531 was christened on 29 Jul 1744 in Wentworth, Yorkshire, England, United Kingdom. Elizabeth PARKIN-5532 was christened on 31 Aug 1746 in Wentworth, Yorkshire, England, United Kingdom. Sarah PARKIN-5533 was christened on 10 Jul 1748 in Wentworth, Yorkshire, England, United Kingdom. William MORLEY-2666 was born about 1718 in of Wath-Upon-Dea, Yorkshire, England, United Kingdom. William married (MRIN:1492) Catherine BOWER-2667 on 18 Oct 1743 in Wath-Upon-Dearne, Yorkshire, England, United Kingdom. Catherine BOWER-2667 was born about 1722 in of Wath-Upon-Dea, Yorkshire, England, United Kingdom. Catherine married (MRIN:1492) William MORLEY-2666 on 18 Oct 1743 in Wath-Upon-Dearne, Yorkshire, England, United Kingdom. F i Ann MORLEY-2654 was born in 1748. She died on 28 May 1816. Uriah MOWRY [Parents] 1-2655 was born on 15 Aug 1705 in Civil, Providence, Rhode Island, United States. He died on 6 Feb 1792 in Smithfield, Providence, Rhode Island, United States. Uriah married (MRIN:1493) Hannah ARNOLD WHIPPLE-2868 in 1773. 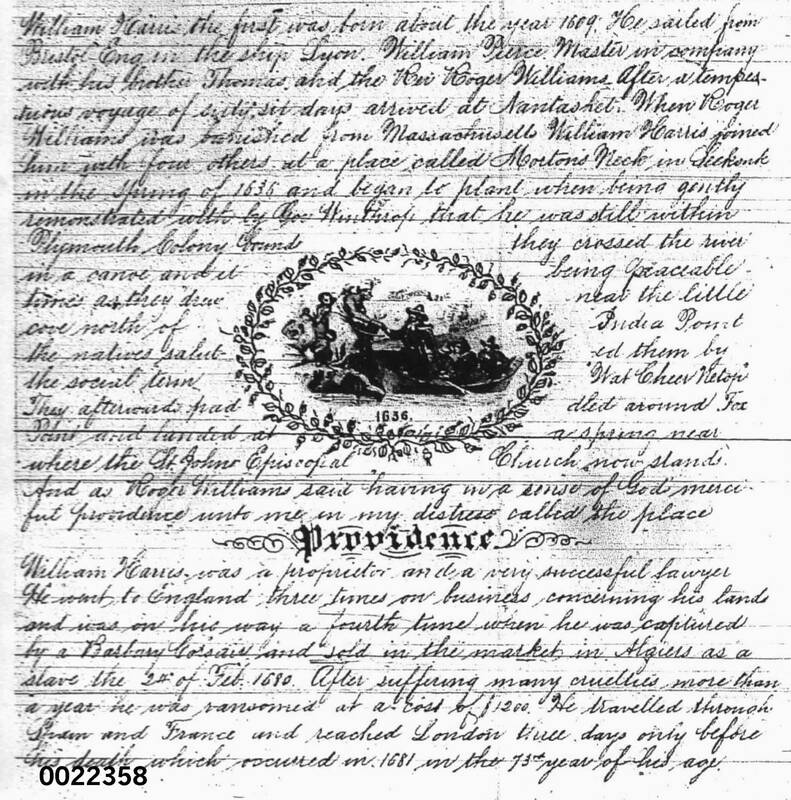 Uriah's will was probated 2 on 20 Feb 1792 in Smithfield, Providence, Rhode Island, United States. URIAH MOWRY, son of Henry, born Aug. 15, 1705, married 1st about 1724, Urania, daughter of John Paine of Providance. She was born July 4, 1706. Married 2d in 1773, Hannah, widow of William Arnold of Providence. She was daughter of Job Whipple. Urania died Mar. 8, 1772. Uriah died in Smithfield March 6, 1792. Hannah survived him. Uriah Mowry was born, lived, and died in Smithfield, Rhode Island. He made a will on feb. 7, 1792, which was duly probated in Smithfield. Uriah Mowry served as a private in the. Revolutionary war in the 2nd regiment, Providence County, Rhode. Island, militia under captain Daniel Mowry and colonel Chad Brown. Capt. Daniel Mowry was Uriah's first cousin, their fathers being brothers (joseph and henry,). there are at least three women who have joined the. D.A.R. on Uriah's service record. These three. Are numbers 134460, 140065, and 143914. These three follow the line of uriah's son, gideon, to Gideon's daughter, Diana, who married into the Ballou family, which also had a revolutionary war service record. Urania Paine. Was the eleventh and youngest child of John Paine (Payn) 3rd (1658-1718) and Elizabeth Belcher,who was a daughter of Josiah Belcher and Urania Rainsford. Urania Paine's brother, Benjamin, married Amey Mowry, a daughter of John Mowry, 2nd, in the John Mowry line, this Benjamin, by his four wives had 28 children, all in Smithfield, Rhode. Island. Mrs. hannah arnold was a daughter of job whipple, and was the widow of william arnold. She was william arnold's fourth wife and he was her third husband. Hannah ARNOLD WHIPPLE-2868. Hannah married (MRIN:1493) Uriah MOWRY-2655 in 1773. Henry MOWRY [Parents] [scrapbook] 1, 2-2670 was born 3 in 1671 in Providence, Providence, Rhode Island, United States. He died 4 on 23 Sep 1759 in Smithfield, Providence, Rhode Island, United States. Henry married 5 (MRIN:1494) Mary BULL-2671 on 27 Nov 1701 in Providence, Providence, Rhode Island, United States. HENRY MOWRY, son of Nathaniel, born about 1670, married 1st in 1701 Mary, daughter of Isaac and Mary Bull of Newport. Married 2d in 1726, Hannah Mowry, widow of John Mowry 2d of Smithfield. Her maiden name was Packard. Mary died about 1728. Henry died in Smithfield, Sept. 23, 1738. Hannah survived him. Hewry Mowry (Nathaniel, Roger), son of Nathaniel Mowry and Joanna Inman, was born?, died Sept. 23, 1759, married first Nov. 27 1701 Mary Bull issue. Uriah Mowry b. Aug. 15, 1705 d. March 6, 1792. Henry Mowry married second Jan.4,1733 Mrs.Hannah Mowry. There was no issue from the second marriage. Henry Mowry was born, lived, and died on the. Farm home. Of his father in Smithfield, Rhode island. He. Was a very active man and was constable. For many years. He and his brother, Joseph, had a dispute over the property line between their farms. This continued for some time, during which one sued the other for trespass, and was in turn sued for assault and battery. Finally, in 1721, the dispute was settled by arbitration. Henry left a will, and his sons, Jonathan and Elisha, were the executors. Mary Bull was a daughter of Isaac and Mary Bull. We do not know her birth and death dates, but she must have died previous to Jan. 4,1733, when henry married second, Mrs. Hannah Mowry, whose maiden name was Packard, was the widow of john Mowry, 2nd, who was a son of Nathaniel's brother, John. Mary BULL [Parents] 1-2671 was born in 1680 in Providence, Providence, Rhode Island, United States. She died on 4 Jan 1725. Mary married 2 (MRIN:1494) Henry MOWRY-2670 on 27 Nov 1701 in Providence, Providence, Rhode Island, United States. F i Mary MOWRY-3230 was born on 28 Sep 1702. M ii Uriah MOWRY-2655 was born on 15 Aug 1705. He died on 6 Feb 1792. M iii Jonathan MOWRY-3229 was born on 1 Jun 1708. M iv Jeremiah MOWRY-3227 was born on 7 Apr 1711. F v Sarah MOWRY-3228 was born on 5 Apr 1717. Peter LOTT [Parents]-6452 was born about 1660. He died 1 in 1721 in Hopewell, Mercer, New Jersey, United States. Peter married (MRIN:1495) Nishe-6453 about 1685. Peter resided 2 in 1698 in Hempstead, Long Island, New York United States. Married NISHE (Dutch for Ann, Anna or Hannah, and more frequently spelled Neatje, Natje, Annatje, etc.). 1708. May 25. Peter Lott purchased from Standeland, property in Maiden­head, N.J.
1715. Nay 30. Peter Lott sold property to Brearley, in Maidenhead, N.J.
My will is that my lands and Tenaments both here and at Burlington be sold by my Executors and my debts paid out of same. And I give and be­queath unto Nishe my dearly beloved wife one Third part to her and her heirs and assigns forever. Item: I give and bequeath unto my five cliii­dren all the remainder of my estate goods chattels to go equally (except six shillings which I give my son Peter more than to the rest), Moreover my will is that my Dearly beloved wife aforesaid, and my loving sons Peter Lot and John Phillips be Executors. Proved April 17, 1721 N.J.W. Res:- Hempstead, Newtown, L.I; Maidenhead, Hopewell, N.J.
Nishe-6453. Nishe married (MRIN:1495) Peter LOTT-6452 about 1685. Peter LOTT-6463 died 1 in 1764. Annatje LOTT 1-6464 was born about 1697. She died on 2 Jan 1789. Jane LOTT-6466 was christened 1 on 29 Jan 1703 in Reformed Dutch Church, Jamaica, New York, United States. M v Capt. Henry LOTT-2657 was born in 1707. He died on 21 Dec 1784. Francis WYARD [Parents]-2727 was born about 1609 in of Saxtead, Suffolk, England, United Kingdom. He died in Earl Soham, Suffolk, England, United Kingdom. Francis married (MRIN:1496) Margaret BARDWELL-2728 on 15 May 1635 in Earl Soham, Suffolk, England, United Kingdom. Francis had a will on 29 Apr 1664 in Earl Soham, Suffolk, England, United Kingdom. Francis Wyard, a cooper, and Margaret Bardwell were married in 1635 at Earl Soham, county Suffolk, England. Margaret died before 1664, as did two of the couple's five children. In his will, dated 29 April 1664, Francis gave property in Debenham to his Sons William and John. To his daughter Ursula, the wife of “Steaven Alldis,” he gave property in Earl Soham. He appointed his brother Randolph Wyard to be executor. Margaret BARDWELL-2728 was born about 1614 in of Earl Soham, Suffolk, England, United Kingdom. Margaret married (MRIN:1496) Francis WYARD-2727 on 15 May 1635 in Earl Soham, Suffolk, England, United Kingdom. Henry WYARD-5575 was christened on 21 Sep 1636 in Earl Soham, Suffolk, England, United Kingdom. Ursula WYARD-5577 was christened on 19 Nov 1637 in Earl Soham, Suffolk, England, United Kingdom. William WYARD-5576 was christened on 3 Mar 1638/1639 in Earl Soham, Suffolk, England, United Kingdom. F iv Ursula WYARD-2661 was christened on 12 Feb 1640/1641. She was buried on 29 Jan 1700/1701. John WYARD-5578 was born about 1643 in of Earl Soham, Suffolk, England, United Kingdom. Samuel NEWSON-2680 was born about 1695 in of Kelsale, Suffolk, England, United Kingdom. He was buried on 18 Sep 1752 in Carlton, Suffolk, England, United Kingdom. Samuel married (MRIN:1497) Elizabeth ESTAUGH-2681 on 6 May 1711 in Kelsale, Suffolk, England, United Kingdom. When Samuel Newson and Elizabeth Estaugh (Easthaugh) were married at Kelsale, Suffolk, England, in 1711, Samuel was listed as being “of Canton,” a neighboring village. Samuel and Elizabeth made their home in nearby Swefling, where their children Alice and Joseph (or Joshua) were christened in 1714 and 1720. Joseph died at about the age of one month. Though the christening of daughter Ann has eluded discovery, she was likely born at Swef­ling about 1717. By 1721. we find the family living in Carlton, where two more children, Elizabeth (1721.) and Jonathan (1724), were christened. Wife Elizabeth apparently preceded her husband in death. His will, dated 24 January 1752, fails to mention her. In the will he calls himself Samuel “Nuson,” yeoman. Son Jon­athan must have died before 1752 also, but likely had married first, as Samuel names a granddaughter Margaret “Nuson.” Also named are the daughters' husbands: Robert Backhouse, who was to have Samuel's clothing; Joseph AbletL; and John Bottred.” To his daughter, Ann Bottred, Samuel gave his clock. Samuel was buried 18 September 1752 at Canton. Elizabeth ESTAUGH-2681 was born about 1695 in of Kelsale, Suffolk, England, United Kingdom. Elizabeth married (MRIN:1497) Samuel NEWSON-2680 on 6 May 1711 in Kelsale, Suffolk, England, United Kingdom. F i Alice NEWSON-5584 was christened on 3 Oct 1714. F ii Ann NEWSON-5585 was born about 1717. Joseph NEWSON-5586 was christened on 10 Jan 1719/1720 in of Swefling, Suffolk, England, United Kingdom. He was buried on 14 Feb 1719/1720. F iv Elizabeth NEWSON-2663 was christened on 2 Apr 1721. She was buried on 8 Nov 1796. Jonathan NEWSON-5587 was christened in 26 __ 1724 in Carlton, Suffolk, England, United Kingdom. Clement KING [Parents]-2668 was born about 1635 in England, United Kingdom. He died on 12 Nov 1694 in Providence, Providence, Rhode Island, United States. Clement married 1 (MRIN:1498) Elizabeth BAKER-2926 on 5 Feb 1672 in Ipswich, Essex, Massachusetts, United States. Elizabeth BAKER [Parents]-2926 was born about 1645 in Ipswich, Essex, Massachusetts, United States. She died on 10 Dec 1708 in Swansea, Bristol, Massachusetts, United States. Elizabeth married 1 (MRIN:1498) Clement KING-2668 on 5 Feb 1672 in Ipswich, Essex, Massachusetts, United States. Clement KING-2927 was born about 1672 in Marshfield, Plymouth, Massachusetts, United States. F ii Joanna KING-2928 was born in Sep 1674. She died in 1723. M iii Ebenezer KING-2929 was born about 1676. He died on 28 Sep 1710. M iv John KING-2930 was born on 1 Apr 1677. He died on 18 Sep 1723. M v James KING-2931 was born about 1678. He died on 19 Nov 1756. F vi Elizabeth KING-2932 was born about 1680. She died on 28 Mar 1736. Thomas KING 1-2933 was born about 1682 in Marshfield, Plymouth, Massachusetts, United States. He died 2 on 10 Oct 1723 in Marshfield, Plymouth, Massachusetts, United States. KING, Thomas, of Pr, husbandman. Will dated 1 Oct, he died 10 Oct 1723, proved 11 Nov 1723, p. 164- 165. Mentions: Brothers John King and Ebenezer King. Brother [-in-law?] Richard Harris. Nephew Richard Harris Jr. Friend William Turpin exor. Witn: Robert Currie, Joseph Browne, Joseph Jencks. Clement KING [Parents]-2668 was born about 1635 in England, United Kingdom. He died on 12 Nov 1694 in Providence, Providence, Rhode Island, United States. Clement married (MRIN:1499) Joanna PRATT-3004 on 10 Jan 1655 in Marshfield, Plymouth, Massachusetts, United States. Joanna PRATT-3004. Joanna married (MRIN:1499) Clement KING-2668 on 10 Jan 1655 in Marshfield, Plymouth, Massachusetts, United States. Clement KING [Parents]-2668 was born about 1635 in England, United Kingdom. He died on 12 Nov 1694 in Providence, Providence, Rhode Island, United States. Clement married 1 (MRIN:1500) Susanna ATWOOD-3005 on 8 Jul 1666 in Marshfield, Plymouth, Massachusetts, United States. Susanna ATWOOD-3005. Susanna married 1 (MRIN:1500) Clement KING-2668 on 8 Jul 1666 in Marshfield, Plymouth, Massachusetts, United States.